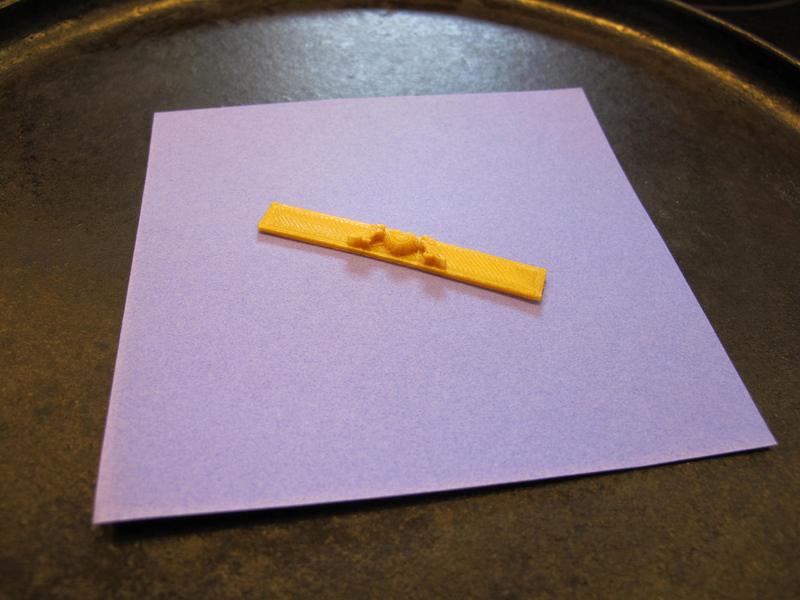 Today we have the pleasure to bring you yet another great guest contribution: this time, Jim Rodda shows you how to create your own 3D printed jewelry. Learn how Jim uses heat deformation to shape a 3D print that was printed flat into a ring that fits snugly onto your finger. All the 3D model files used in this tutorial have been thrown in for free! 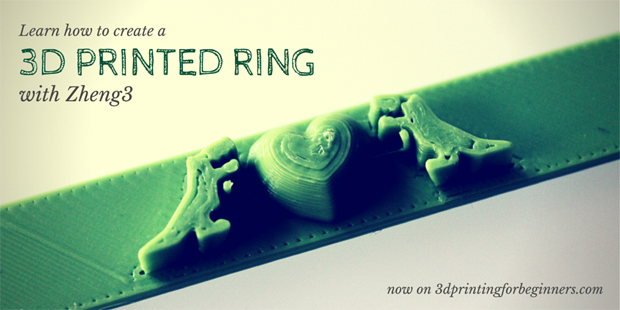 Read on, go grab the 3D model files and print your own, unique ring. Hiya! 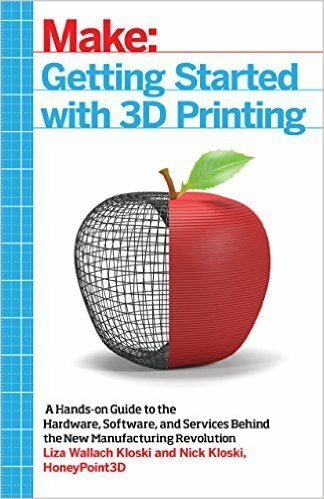 I’m Jim Rodda, best known to the 3D printing community as Zheng3, and I’m honored and privileged to have a guest blogging gig here at 3dprintingforbeginners.com. Zheng3 Kickstarter #2 is in full swing, so this is an excellent time to share some tips and techniques for getting more out of your shiny new 3D printer than you may have thought possible. But first, a video! 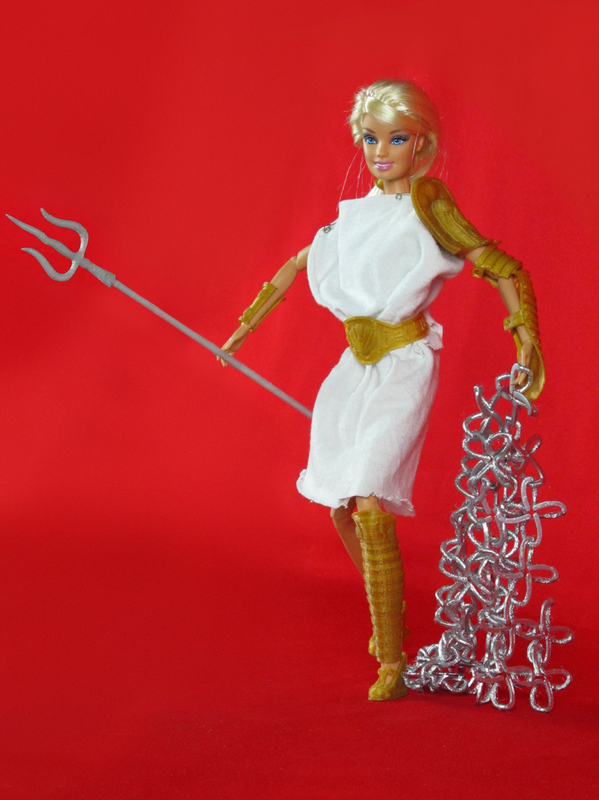 This time around we’re crowdfunding a 3D-printed Barbie Compatible Roman chariot that can, in theory, be pulled by cats. Clever-eyed viewers will note the presence of a few models that look impossible to print with a hobbyist 3D printer, notably Barbie’s armguard and belt. Here’s the wily 3d-printing veteran trick: they’re modeled and printed flat and then heat-deformed later on to achieve their final shape. Cool, right? Onwards and Upwards Into Tutorial-Land! This whole project shouldn’t take more than an hour to complete from download to final print. It assumes that you already have a 3D printer and are comfortable with the basic aspects of its operation. The first part of this post is just enough of a guide to get your feet wet with Meshmixer, and then we’ll move on to post-processing the print and making a customized ring. First you’ll need to go grab Autodesk Meshmixer and the batch of tutorial models created at Zheng Labs just for this project. I’ve also included step-by-step Meshmixer files so you can follow along, and a few pieces of 3D clip art you won’t need for the tutorial but can use for self-guided exploration later on. Those Chinese characters are, left to right, peace, joy, and love. Wouldn’t be a Zheng3 post without some peripheral mention of Chinese language learning. 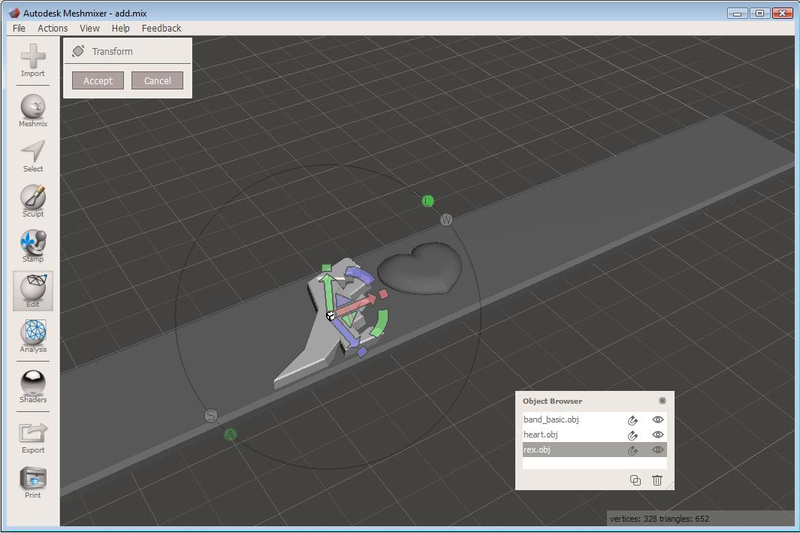 Launch Meshmixer and click the “Import” button to start working on your ring. For this demo I’ll use the basic ring band. 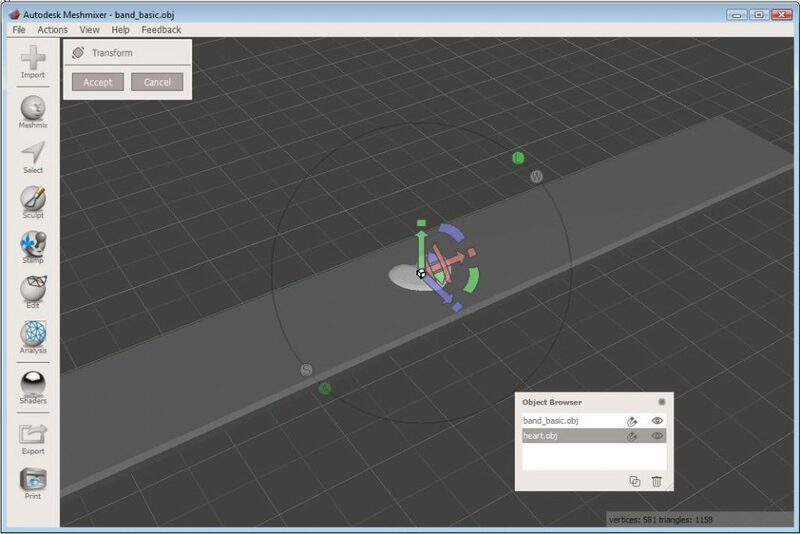 Spend a minute or two poking around in Meshmixer’s UI. It’s quite straighforward; Right click and drag to orbit the scene, middle-drag to zoom. Click a mesh to select it. Click the Import button again to add the heart to your ring. A dialog might ask if you’d like Meshmixer to attempt to fix a problem with the heart being smaller than the rest of the scene. Click no and move on, it’s all good. The Object Browser will be very useful when you start dealing with multiple meshes. It should appear when you import the heart. The bulk of the heart intersects the band by default. We’ll need to move it up just a bit in Y to make it visible. 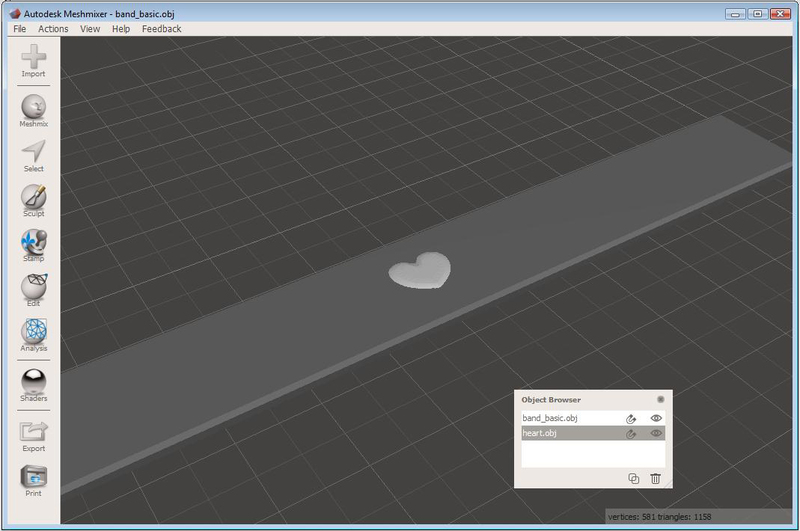 Select the heart in the Object Browser, and press the T key to activate Transform mode. (Transform is just a fancy way of saying “move.”) The Transform manipulator appears! The Transform button is also nested under the Edit button if you’re the sort who eschews keyboard shortcuts. Grab the manipulator by the green arrow (R-G-B correlates to X-Y-Z) and nudge the heart upwards until the base of the heart creeps out of the top surface of the band. Scale the heart a bit in Y by dragging the green rectangle so it really bumps out of the band surface. Click Accept to approve your changes. Repeat this process to customize your ring with a few other models. I’ve added a pair of T. rexes to mine using the Mirror tool. First, some small scaling tweaks are in order to make the rexes smaller and the heart a little larger; grab the white cube at the center of the Transform manipulator to uniformly scale the T. rex. 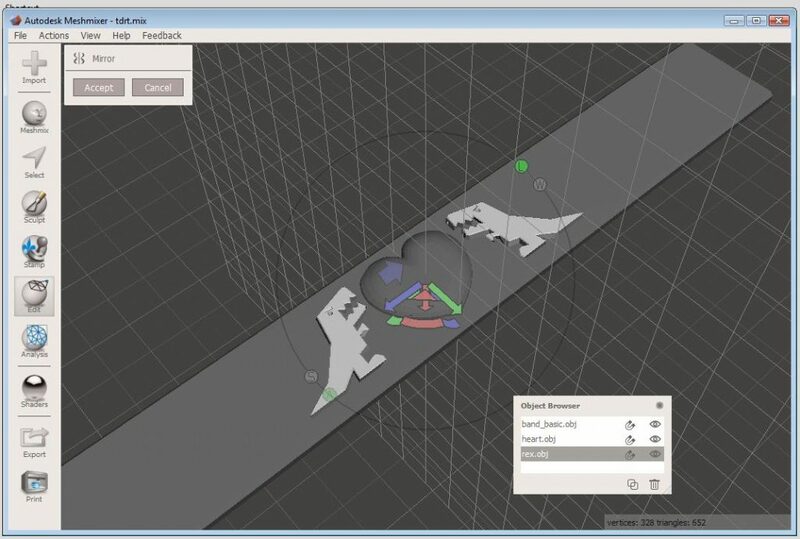 Then select the rex and use Edit->Mirror to copy him across the Z-axis. He’ll temporarily disappear when you select the mirror tool, but just click the purple reflection arrow to bring him and a mirrored doppleganger back into the scene. The model archive contains a few more pieces of 3D clip art you can add to your ring, or you can stop detailing and move on to exporting and printing. Meshmixer has a bevy of useful mesh modification tools that you can explore on your own, or head over to The Forge to grab a free model for slicing and dicing. Shift-select all three meshes and choose Edit->Combine to soft-merge all three models into a single model. NOTE: Usually it’s better to Boolean join all three meshes together, creating a single shell; printed junctions between the models are stronger and slicing errors will be much reduced. In this case the tiny decoration models will cause Meshmixer’s Booleans to crush all the geometry details and you’ll wind up with a tesselated blob-monster instead of a ring. For this tutorial we’ll stick with Edit->Combine instead. Slicing and printing the model after clicking Export is left as an exercise for the reader. I’m slicing at a .15 layer height in Cura and printing on a 2014 Type A Machines Series 1. I’m printing in BuMat PLA — you’ll need higher temperatures if you attempt this with ABS or some exotic material. PLA plastic melts at a relatively low temperature; tales abound of 3D prints drooping Dali-esque over car dashboards on hot days. We can use that property to do a simple heat deformation on our flat ring and make it, well, more ring-shaped. A kitchen stove at its lowest setting will give you plenty of heat for this part of the project. I used a cast-iron skillet with a piece of construction paper for my heating setup. Put the ring on the paper and wait. The plastic will become soft enough to mold in three to five minutes. The plastic might get hot enough to burn human skin with prolonged contact, so I recommend molding the ring against something finger-shaped rather than a live finger. You’re in the kitchen already, so grab a carrot out of the fridge and use that instead. …and you’ve got a dandy piece of 3D-printed jewelry before you can say Bob’s your uncle. 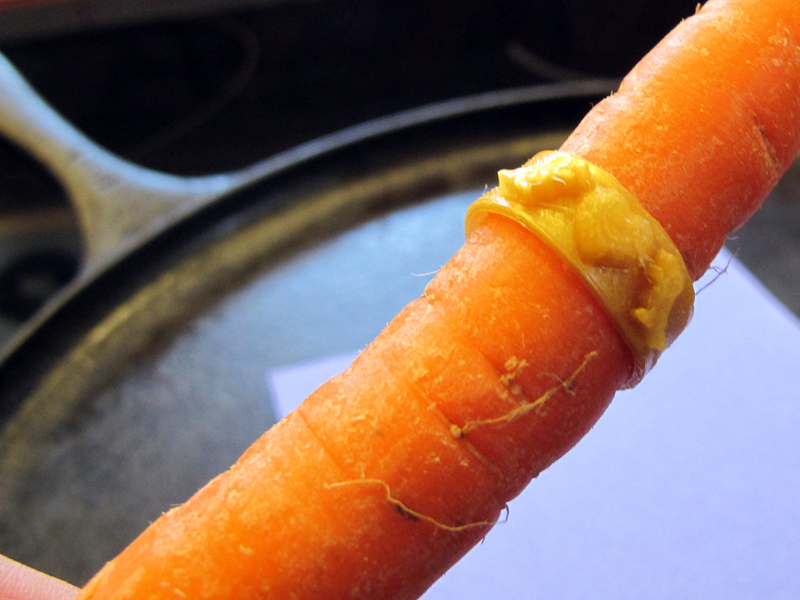 You might not have a perfect fit for your finger (depends on the carrot, really) so further ring softening can be accomplished with a common hair dryer. Hope you enjoyed the tutorial and found it useful in broadening your thinking about post-processing the plastic that comes off your printer. 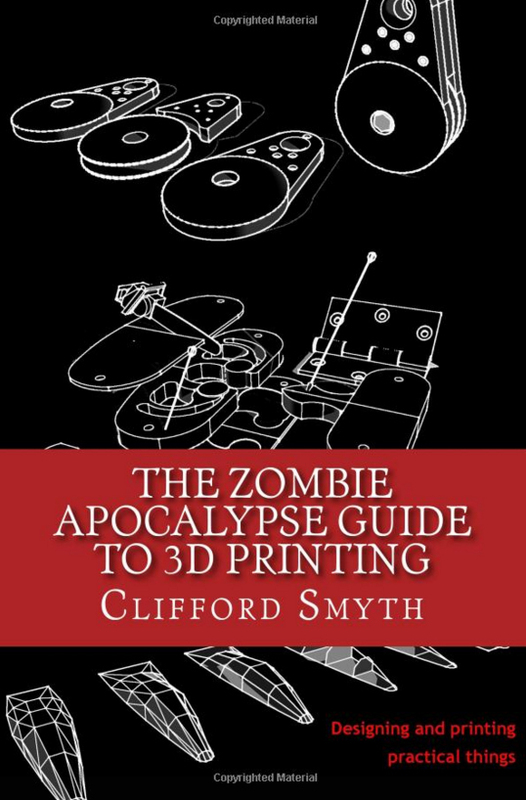 Drop me a line if you need some advice on the process or 3D printing in general, and don’t forget to share the Kickstarter video far and wide!